They're over 300 feet high. They kill birds. They're linked to cancer. Donna Tisdale’s home office looks like something out of an episode of the TV show Hoarders. Paperwork spills off a crowded desk. Boxes are strewn on the floor. Every inch of space is consumed with reports, educational mailers, studies, and oversized maps of green-energy projects slated for the community of Boulevard. California has mandated that by 2020, 33 percent of our energy must come from renewable sources. As of 2010, only 14.5 percent of California’s energy came from renewable sources, resulting in a push to create more solar and wind farms. In 2012, California’s wind-energy generation soared, and we are now second in the nation for wind-generated electricity. The community of Boulevard is transitioning into an industrial, green-energy zone. Wind and solar companies have descended on the area with plans to erect wind turbines, solar panels, electric substations, and access roads. Iberdrola’s Tule Wind (15,000 acres), Invenergy’s Shu’luuk (4739 acres), and Enel’s Jewel Valley (8000 acres) are all green-energy projects currently in the works for this small backcountry community. If they are approved, thousands of acres in Boulevard will be consumed. Donna Tisdale is doing her best to prevent it. Attempting to find Tisdale’s Morning Star Ranch, I make a wrong turn at an oak tree and end up on a rocky dirt path surrounded by horses and pick-up trucks. I consult a map. A man in a dusty sedan bearing a “Where in the Hell is Boulevard?” bumper sticker pulls up beside me. “Where are you headed?” he drawls. He sends me off with a friendly wave. I follow his directions, ignoring the “No Trespassing” signs, and wind up on a dirt road reserved for the Border Patrol. I stop my vehicle near the big metal fence. A patrol agent with a gun holstered to his hip and binoculars around his neck approaches my vehicle. To my relief, he is also familiar with Donna. From the Desert View Tower in Jacumba, one can see a few of the Ocotillo Express Wind Energy turbines. The agent draws a map in the dirt with his steel-toed boot. I take a photo with my phone. Ten minutes later, I drive through a gate that features an large wooden sign with three cowboys on horseback. Underneath it reads: “We don’t dial 911.” I have found the Tisdale ranch. A tail-wagging beige mutt greets me. Behind him, a horse stands lazily in its pen near a hillside covered with tangled chaparral blackened by the Shockey Fire, which ripped through Boulevard in the fall of 2012. Tisdale opens her screen door and without a word guides me through her kitchen and into the dining room. She motions for me to take a seat at a round dining table. She stands next to a group of large maps and immediately gets down to business, handing me a stack of paperwork on green energy. She then goes into a lengthy explanation of where the turbines and solar panels will be placed. The presentation is like a college lecture. It’s clear she’s done this before — many times. Five minutes in, she’s interrupted by a knock on the door. It’s a neighbor, a petite, middle-aged woman with jet-black hair. The woman hands Tisdale a 50-dollar check to help fund the educational mailers that she sends out to the community. Earlier this year, one of these 141-foot blades fell off a giant wind turbine at this site in Ocotillo. When the Campo Band of Mission Indians first proposed the landfill in the late 1980s, Donna and her husband Ed Tisdale contended that it would have negative impacts on the community of Boulevard. The dump, they believed, would create pollution and poison water wells. Tisdale created the Backcountry Against Dumps organization. She educated the community and got the citizens of Boulevard involved in fighting the landfill. As a result, in 2010 the Campo tribe voted it down. Tisdale grew up down the hill in Imperial County, in Brawley, and has resided in Boulevard for over 30 years. She feels an obligation to protect her community’s beauty and integrity. As you enter the Manzanita Indian Reservation north of Boulevard, the Kumeyaay Wind Farm turbines can be seen from the road. They stretch across the hillside, resembling skyscraper versions of pinwheels placed in springtime gardens. The 25 wind turbines stand side-by-side. They are the size of 20-story buildings, with 218-foot-tall towers and 141-foot blades. The gentle whooshing sound combines with spinning shadows tossed against the ground to produce a hypnotic feeling. They look serene. Turbines owned by the Campo Tribe are on the Campo Reservation, which borders the Manzanita Reservation. Annoyance with the rotating shadows of distant wind turbine blades prompted Ginger Thompson to cover her windows. Ginger Thompson, a Manzanita tribal member, owns a home less than a football field away from the turbines. Since the construction of the wind farm, Thompson and her neighbors have complained about serious health issues. Thompson recently had part of her kidney removed after being diagnosed with kidney cancer. She and a handful of her neighbors were invited to participate in a Cal State San Marcos medical study to determine if their ailments are linked to the turbines. An epidemiologist tested the homes that sit closest to the wind turbines on the Manzanita Reservation, confirming the presence of unconventional levels of electrical current, electromagnetic fields, and electromagnetic interference with power quality. Epidemiologist Dr. Samuel Milham, adjunct professor at Mount Sinai School of Medicine and author of Dirty Electricity, visited the Manzanita Reservation twice to measure ground, air, and building stray voltage. He found that those living on the reservation are exposed to levels of transient voltage a thousand times higher than normal in their air and soil. Milham reports that the turbines produce enough dirty energy to sufficiently increase the risk of cancer, diabetes, heart disease, and attention-deficit disorder. Thompson sits in a low-backed chair in the conference room at the Southern Indian Health building on the La Posta Reservation, where she works. Through a picture window, Kumeyaay windmills spin on the chaparral-covered hillside. After her cancer diagnosis in November 2012, Thompson began taking precautions. She no longer allows her 11-year-old granddaughter to play outside in the yard without her shoes on. Before going to bed, Thompson makes sure all the electronics in her room and her granddaughter’s room are unplugged. Thompson and her granddaughter recently bought seeds to plant a garden to grow their own fruits and vegetables, but she is rethinking that idea. She isn’t angry that the turbines were built. Initially, like many others, she believed they were a good alternative. She points to a lack of public education by the green-energy companies. Three miles away, on the other side of I-8, Boulevard resident Don Bonfiglio is also impacted by the Kumeyaay Wind Farm. “The sound they produce is driving me crazy,” he says. We’re sitting at a table in the Manzanita Diner, off Old Highway 80 in the center of Boulevard. It’s a Saturday afternoon, and we share the restaurant with one other patron. Bonfiglio hears the buzzing whenever he’s home. It’s worse at night, but also noticeable during the day. Dr. Nina Pierpont, MD, PhD — she was educated at Johns Hopkins and Princeton — coined the term “Wind Turbine Syndrome” to describe symptoms experienced by many who reside near windmill installations. Side effects include: headaches, vertigo, ringing of the ears, nausea, panic attacks, sleep disturbance, and memory and concentration issues. California State San Marcos researcher Arcela Nuñez-Alvarez found that 68 percent of those living on the Manzanita Reservation suffer from chronic sleep disorders and other problems associated with Wind Turbine Syndrome. Illnesses attributed to the low-frequency noise — infrasound — produced by wind turbines, have been compared to a Navy study on motion sickness induced by the physical vibration of pilots in flight simulators. Sickness occurred when the vibration frequency was in the range of 0.05 to 0.9 Hz, with the worst effect being at about 0.2 Hz, similar to the frequency of large wind turbines. The industry’s response to claims of excessive low-frequency noise from wind turbines has always been that the levels are so far below the threshold of hearing that they are insignificant. The Wisconsin Public Service wind-infrasound study at the Shirley Wind Farm demonstrated that industrial-scale wind turbines can be linked to the adverse health effects grouped under Wind Turbine Syndrome. At most locations where health problems occur, the wind turbines are generally not audible. Health problems were unrelated to those arising from noise problems and associated annoyance issues. Residents could sense when the turbines turned on and off, even when they couldn’t “hear” them. The measurements at Shirley showed that low-frequency infrasound is present and relevant. The tests demonstrated that not only do wind turbines produce significant levels of infrasound, they also produce it in a frequency range below the ability of most professional acoustical instruments to accurately measure. This explains why other studies of wind-turbine infrasound have failed to identify similar levels. “The sound they produce is driving me crazy,” says Don Bonfiglio. The U.S. Fish and Wildlife Service is preparing to issue “take permits,” which allow wind-turbine developers to suffer no consequences when federally protected eagles are killed by the wind turbines. Iberdrola Renewables, a company that received over $1.5 million in U.S. stimulus funds and is planning a wind farm in Boulevard, is a key player in pushing take permits for the wind industry. Bonfiglio bought property in Boulevard 13 years ago with a plan to retire on his 250 acres of land. With the noise from the turbines, however, and plans for more to go up, he’s looking to move. Bonfiglio views the turbines as more trouble than they’re worth. Bonfiglio is concerned about the indifference many in Boulevard seem to feel about the projects. Bonfiglio makes an effort to attend the monthly meetings held by the Boulevard Community Planning Group. He is thankful to have Tisdale fighting to protect Boulevard. Back at Morning Star Ranch, Tisdale arranges to take me on a tour of the existing, and soon-to-be-existing, green-energy projects around Boulevard. New blades were recently installed on turbines at the Ocotillo Express Wind Energy Project. As her SUV ambles down dirt backroads and over paved McCain Valley Road, she gestures out her window, pointing out where turbines, solar panels, and substations will soon be sited. We cruise past the Manzanita Diner on Old Highway 80; nearby solar panels will soon consume a vacant prairie grass–filled field. We pass a video-rental shop, an elementary school, and a post office. We drive past a store called Beaver Creek Trading Company. Rusty washing machines line the entry. A nearby convenience store sheds peeling paint; the sign out front thanks the city’s firefighters for their hard work during the Shockey Fires, which scorched 2556 acres, destroyed 11 homes, and took the life of Tisdale’s neighbor. Some say wind turbines in Boulevard will put the community at even greater fire risk. The Caithness Wind Farm Information Forum has documented 200 wind-turbine fires worldwide since the 1990s. Fires have been ranked as the second leading form of turbine accidents. Over the past decade, the number of nationwide turbine fires has drifted between 13 and 21 each year. Tisdale pulls her car into a parking lot off In-Ko-Pah Park Road, in front of the Desert View Tower. This structure resembles a postcard version of the storybook tower where Rapunzel was locked away, but instead of a long-haired captive, it houses a bizarre museum filled with vintage photographs, artwork, maps, books, and quirky bumper stickers. Four mutts roam the grounds. A staircase leads to the tower’s top floor, where a quarter-fed telescope offers a 360-degree look at the desert. Parts of Mexico and the Pacific Ocean are also visible. But everything is dwarfed by the view of dozens of wind turbines, part of the 12,435-acre Ocotillo Express Wind Energy Project. The land-use status in Ocotillo was changed by the Bureau of Land Management specifically to accommodate the wind-turbine project. Changes were made without economic-impact analysis or a public-comment period on the project’s impact on Anza-Borrego Desert State Park. According to city-data.com, the average price of a home in Ocotillo went from $170,000 in 2007 to $70,000 in 2011, after the wind project went in. In a Washington Times article from March 2013, writer Bill Gunnderson states that as many as 4500 wind turbines have been built and abandoned in California alone. Schultz is frustrated at the lack of community activism when solar and wind companies come into the backcountry of San Diego. “Our community is collateral damage in the process,” Tisdale says. Federal land-management officials have waived environmental laws and conservation planning to allow thousands of acres of energy development on protected land. San Diego County has overridden local land-use regulations in both Jacumba and Boulevard. These projects have also received a pass on some state and federal environmental requirements, while enjoying hefty tax benefits from the federal government. “Donna and I are on opposite sides of the political spectrum,” Schultz says. “I am a Quaker, and she is a conservative. Both of us see that something is seriously amiss here. I really believe that civil disobedience and non-violence are the only way to go. “It’s a monument to idiocy and corruption,” Tisdale adds angrily. Back in Tisdale’s Explorer, we now head toward the wind turbines on the Campo Reservation, and the closer we get, the louder the sound from the blades becomes. It’s as if someone has turned on a vacuum cleaner in the backseat. Along the way, Tisdale points out various pieces of land that will soon be swallowed up by green energy. The Tule Wind Power Project will utilize land sacred to Native Americans and areas of Boulevard that were settled by pioneers in the late 1890s. Recreational land will be robbed of views enjoyed by locals and visitors. Turbines 492 feet tall will dot the landscape. Driving past Carrizo Gorge and the boulder-filled hilltops, it’s hard to imagine what Boulevard might look like once it’s been fully developed into a green-energy corridor. JayJzz Aug. 21, 2013 @ 2:28 p.m.
tstruble Aug. 21, 2013 @ 3:12 p.m.
solar panels for every home, i guess. PJLindsey Aug. 22, 2013 @ 3:42 p.m.
And when you drive past the Kumeyaay Windfarn on I-8 across from the Golden Acorn Casino, you can see blades and hubs littering the ground around the turbine bases. (the results of damage from a Dec 2009 windstorm.) So much for being "green". FYI, the Kumeyaay Windfram is rated at 50MW, but over the past year (July 2012 - June 2013), it has averaged only 16.3MW output, per FERC data. dlwatib Aug. 22, 2013 @ 9:53 p.m. I feel for you and your neighbors, Donna. I wouldn't want to live near a windmill farm either. I am surprised that they are going in close enough to people's homes that they are creating electromagnetic and infrasonic pollution on your properties. We've got lots of unoccupied desert, why are they putting them close to homes? CaptD Aug. 23, 2013 @ 8:06 a.m.
Getting the Wind Up Exploring the concern about adverse health effects of wind power in Australia and Europe snip The study of the situation in Denmark and Germany provides evidence of a different kind; despite the presence of almost 30,000 wind turbines in these two countries, adverse health effects are not a significant issue in either country. In fact, they are rarely mentioned. There are several reasons for the difference between Australia, Denmark and Germany, one of which is the absence of a strong fossil fuel lobby in the latter countries. I'd also suggest that everyone get very interested in the new project Pio Pico Energy Center, LLC (305 MW) with a total cost of about $1.6 billion dollars, being proposed by SDG&E because I believe that it is not only not needed (due to the continues installation of solar roof top panels and/or new wind turbines) but that it will have a far greater negative effect on East San Diego than the above mentioned wind turbine's. DonnaT Aug. 23, 2013 @ 8:45 p.m.
Any one concerned about birds should read this poignant and gut wrenching "Confession of a Windfarm Bird Kill Control Specialist" who "followed death around" : http://www.windturbinesyndrome.com/2013/confessions-of-a-windfarm-bird-kill-control-specialist-michigan/?var=cna. Germany and Denmark communities are, in fact, rebelling against noisy and health- stealing wind turbines. Just like other turbine-impacted communities around the globe. The proposed Pio Pico Energy Center is just one more of SDG&E's expensive and unnecessary boondoggles. However, it is simply false for CaptD to claim that a project located 70 miles away from our neighborhoods could create more negative impacts than the industrial scale wind, solar, and utility infrastructure projects planned as close as 100 feet from existing rural East County residences and other sensitive receptors. padredog Aug. 24, 2013 @ 1:57 p.m. I have one word for all "environmentalists": Really? You have been clamoring for renewable energy for decades. Now that you have significant steps taken to make this a reality, you are opposed to it. Windmills are 300 feet tall, they kill birds, and they are linked to cancer? Again: Really? You greens wanted this, and, now that the view out your window is ruined, you are against it. Your neighborhood cats probably kill as many birds as any windmill. They are linked to cancer from stray voltage? Do you have a radio or a TV? Did you write this article or comment on it with a PC, or mobile device? You better not use them. Even a low power mobile device takes significant energy to manufacture, never mind the stray voltage. The clothes you wear require energy to produce. So, unless you are ready to completely unplug yourselves from the power grid, and run around without clothing, you are all hypocrites. Shame on The Reader for publishing this tripe. Startaster Aug. 26, 2013 @ 5:41 p.m.
Why divide your fellow man into 'us and them'? It is not 'environmentalists' or 'non-environmentalists,' nor 'greens' or 'anti-greens' that put us in this fix. Greed cuts a destructive swath across all political boundaries, age groups and cultures. Words like 'progress,''free enterprise,' and 'green energy' set the marauders loose to ravage and pillage everyone. Let us stop dividing, and rather come together for the good of all. CarlMoz Aug. 24, 2013 @ 3:44 p.m.
Screw it... Lets just build some more coal plants for our power needs. Those are so much better. Or maybe some nuclear plants. The nocebo effect at work. I like to call these issues "non-participating landowner syndrome." Yes wind and solar plants have issues. But the alternatives are drastically worse. Although the anti-renewables crowd is almost always funded by oil and gas shills pushing climate change denier pseudo science. Aboggs Aug. 25, 2013 @ 8:06 a.m.
Nocebo effect, really? So I suppose the thousands of VICTIMS around the globe are just so distraught over these massive noisy, flickering, property decimating, bird killing giants that their symptoms are "all in their head"??!! Wow. The bottom line is this, they do not produce enough energy to amount to squat! How's that for legal jargon?! I live in the proposed Buckeye Wind Farm in Ohio. I tried my best to keep an open mind; however, as a nonparticipating landowner, I literally could not find one benefit. Our country is going bankrupt, in fact already is. Are we really going to continue this corporate welfare? Yes, other forms of energy are subsized, but they actually work. There will always be having to hear the voices of those opposed and supporting, that is the beauty of our country, but compassion is a moral choice. People are suffering. They are abandoning their homes. Families don't do this without a darn good reason. I personally love my home. This is where i brought my little Summer and Khloe home from the hospital. We have custom everythig in our home. Not to mention nearly own it. I hope like heck I'm wrong about all the problems I suspect to occur when the wind farms in my area become operational, otherwise I too will abandon my home. God bless you folks that are living in this nightmare created by greed. Keep doing the good work. Eventually it will prevail. danfogel Aug. 25, 2013 @ 5:04 p.m.
response to aboggd California wind farms supply about 5 percent of our electricty. Tht'a close to enough p[ower for close to 500,000 homes. A little bit more than "squat", imo. Aboggs Aug. 25, 2013 @ 5:41 p.m.
And total energy for the U.S. is 6%.... Like I said, they produce next to nothing. Unless of course if you are reading statistics off of AWEA's website. Regardless, if industrial wind complexes are supposed to save the environment, then more R&D must be done to find a way to store the excess power, otherwise they are backed up by convential power. Which of course means the very source of energy (dirty coal) that the "greenies" are claiming to fight against is being used to spin the blades when the wind isn't blowing. I can't speak for California, but Ohio ranks 37th in being compatable for wind "farm" development. Over 1,000 families will live in the shadow of the Buckeye Wind "Farm" in Ohio. That's a large number of people compared to many areas that host these projects. We have been fighting this since 2006. Like I said before, the beauty of the U.S. is that you can have your opinion and I can have mine. We will throw statistics around until dooms day because we will both get our information from what we feel are reliable sources. I can respect that. But I wish the reasoning behind these huge projects was to really save the planet. I just don't feel that's the case. There are over 100 of these 500 ft IWT's proposed for my area and only 5% of the leaseholders will have to live next to them. Joaquin_de_la_Mesa Aug. 27, 2013 @ 1:43 p.m. But consider the acreage devoted to it? The ratio of acres/kw is VERY high in wind power. Much higher than coal, gas, and nuclear. Founder Aug. 27, 2013 @ 4:47 p.m. So what, NO Nuclear RISK is worth it! Aboggs Aug. 27, 2013 @ 6:42 p.m. The negative effects of industrial wind complexes far surpasses any benefit. They are backed up by conventional power sources; therefore, they will never make us energy independent. What is the true purpose then? Are you making a profit off of this industry? It seems the only proponents have something to gain, leaving the rest of us with nothing other than properties devalued by up to 40%, depending on the distance one lives from IWT's. I don't think this has anything to do with kind hearted souls trying to save the planet. If that were the case, then why not host them on your property for free? This has everything to do with a "get rich quick" scam. My biggest complaint is the irresponsible siting of these projects. These 500 ft machines can be as close as 1,250 near my home in Ohio. Manufactures recommend a setback of 1,640 ft for safety reasons. It is just ridiculous what is going on right now. Squeezing these industrial machines where they do not belong! Aboggs Aug. 27, 2013 @ 6:57 p.m. Please allow me to correct myself. I meant to say, a 500 ft industrial wind turbine can be as close as 1,250 ft from my home in Ohio. That's way too close considering most manufactures recommend a setback of 1,640 ft for safety reasons. Draven000 Aug. 25, 2013 @ 1:01 p.m. Typical NIMBY garbage. No one is willing to accept any inconvenience associated with cleaning up the environment. The reason government mandates are necessary is because the free market can't, or simply wont, account for the environment damage energy generation causes. Everyone wants a free lunch. Aboggs Aug. 25, 2013 @ 1:44 p.m.
Aboggs Aug. 25, 2013 @ 1:48 p.m. Besides, when the wind doesn't blow, what do you think powers these massive machines, geesh! jja262 Aug. 26, 2013 @ 9:01 p.m.
Wind turbines might be annoying, but they do not cause cancer. The Reader has destroyed its credibility by printing such a poorly researched article. We need more wind farms, not less. Each wind turbine supplies enough electricity for about 1,000 houses, and it reduces our dependence on dirty power plants that burn coal or gas. Founder Aug. 27, 2013 @ 4:50 p.m.
Thumbs Up! Agreed and I bet many will start to consider relocating there for that reason! Founder Aug. 27, 2013 @ 4:54 p.m.
DonkeyHoty Aug. 27, 2013 @ 6:54 p.m.
Aboggs Aug. 27, 2013 @ 7:05 p.m. I know enough to know how to spell English correctly. And you... Not so much! You can slam me all you want. I attempted to remain respectful, but clearly class is not something you are familiar with. The people in my community have been fighting the largest industrial wind farm in Ohio, The Buckeye Wind Farm. I did my best to keep an open mind. After living with a family in the footprint of The Shirley Wind Farm for 1 month, I no longer COULD keep an open mind. I will assume you turn a profit off of this industry. Only a backwoods goof would get on here and spout your junk facts as credible information. ChampaignCountyProgressive Oct. 11, 2013 @ 8:26 a.m. It appears that you would benefit tremendously by becoming acquainted with the work of Dr. Robert McCunney of MIT and European studies that concluded that a small percentage of people reported being annoyed by sound levels of up to 35 dB. These adversely affected folks had a thread of commonality. Anxo Aug. 27, 2013 @ 7:07 p.m.
Let's be logic: yes, wind turbines kill birds. What about cars? Don't cars (or people driving them) kill them also? Some facts: in USA, EVERY DAY, ONE MILLION ANIMALS are killed by cars; that includes not only birds, but also mammals, reptiles, and amphibians (somehow, insects and bugs are not counted on this number). For deers accidents only, besides the poor deers, we have 200 people killed and 1.1 billion or property loss every year. I cannot give an exact number for the deers, although it is estimated that 26 % of the daily million above correspond to "large animals" (and that does not count humans). To not mention that cars have killed half of the Florida panthers, a rare species; kill black bears, miniature Florida key deers or cougars in an alarming number. Are we willing to give up cars? Next question: are we willing to give up the use of electricity (all of us, including people opposed to them)? No? Then, do we prefer use coal plants or nuclear? Sometimes a wind turbine gets in fire: and, out of fairness, I have to say that it seems that wind turbine accidents have killed 35 americans. Don't be scared, they were killed not by turbines falling on them, but in accidents related to their construction or servicing, like any other industry. No, let me rectify: nuclear plants have not killed anyone since we start using them. At least not directly. We still have the issue with the nuclear residues that we don't know where to lleave and we end damping them in the sea or buried them. Some of the aftermath products are radioactive for thousands of years. Do we remember Chernobyl or Fukushima? Do we remember the scary moments of the Three Mile Island, or the incident with BP in the Gulf of Mexico? In the other hand, my job allows me to see a lot of windfarms all over USA. I have seen one hundred cows follow the shadow of a wind turbine in Texas, just to get cover from the heat. They got used to the turbines, and certainly, if we could ask the cows, they may have a different opinion than some of our friends here. .
Anxo Aug. 27, 2013 @ 7:09 p.m. Significantly enough, somebody up here said "as a nonparticipating landowner, I literally could not find one benefit". This is key. I have also seen that the maximum resistance where wind farms are located come from two groups: landowners that did not have the financial opportunity of having one turbine in their property, or people who lost their jobs in coal mines and blaim the wind turbines for that, not realizing that the cause for losing the jobs are many others (market profit for that industry being the main one). Visual impact? Maybe. We can also ask our children, they may have a different opinion. In Bear Creek windfarm, in PA, I have seen local families camping at the base of one of them, they didn't seem bother for that. Noise? Some, sure, but these windfarms have to pass strict protocols for noise level, and they develop software that lowers these levels even more, or software that takes in account bat migration and stops the turbines in the season. In Big Horn project (WA), there is one turbine that does not run on the day because there is an eagle who lives close to it. I wish that other industries were so respectful. There is not energy who have side effects. I am just saying that all of us should ask ourselves what are we able to give up to have air conditioning or heating for us and our children. That's all. Aboggs Aug. 28, 2013 @ 8:25 a.m. I will comment since you cleay are referring to my post. Yes, as a non participant I stand nothing to gain, but I wouldn't have signed my property rights away regardless. Research what leaseholders are complaining about, and don't assume I wasn't contacted by a wind developer to lease my land. Aboggs Aug. 28, 2013 @ 8:34 a.m.
Wind developers botch noise standards. EverPower Wind Holdings used one calculation for phase one of the Buckeye Wind Farm and when proposing phase two they used an entirely different method to calculate noise. When asked why they did this by the OPSB, the acoustician said if the first method were used for phase two, the cumulative impact would prove to be too much noise for our rural area. I cannot speak for all project developers, but the one in my area is certainly not ethical. If this is happening in my area, how can I not assume it isn't happening elsewhere? DonkeyHoty Aug. 27, 2013 @ 7:20 p.m. It would naturally follow that energy consumers, after viewing their electric bills, would take issue with the source of their energy? If you could energize your home with the methane produced by grumping about it, if your kids ( I MUST have kids) could work a treadmill to produce the energy they consume by leaving the lights on and playing video games then you might break even, but who the hell even tries? If? If you really cared you would sit in the dark and eat your imported shoes. If you really cared you would sit in the garage and eat the exhaust of your imported car. The future is bleak, and then there will come the issues of WATER. YOUR CHILDREN ARE CONDEMNED BY YOUR GREED. zwills Aug. 28, 2013 @ 12:13 a.m.
Mr. Siobhan Braun, this is reprehensible. You've interviewed disgruntled locals only and made absolutely no attempt to fact check what they said or cover both sides. You got a cover page article that says wind turbines are "linked to cancer". Really?! Put up a valid source for this wild claim, or issue an apology to your readers. AudreyHorne Aug. 28, 2013 @ 7:53 a.m.
Anxo--are cars slicing endangered birds in half? I don't think so. That's a silly comparison. Founder-I can guarantee that you do not want to live in a green energy zone. Spend a week at Don Bonfiglio's and see if you have the same thoughts. I am going to go out on a limb here and assume that those commenting in favor of the wind industry don't have the pleasure of living near these monstrosities. Do me a favor and drive through Ocotillo in the evening. It's akin to being on the set of a horror flick. The turbines look like evil giants affixed with forever blinking red lights. When turbines line your backyard, by all means have an opinion. We can do better than this and we must. We all want green energy but not like this. We need efficient and healthy green energy. zwills Aug. 28, 2013 @ 1:25 p.m.
@Audrey, I agree the blinking red lights are annoying to locals at night. Unfortunately they are required by the FAA on all structures greater than 200 feet. I work in both wind and solar energy, and I can tell you from experience that they are the most efficient green energy sources available (apart from energy efficiency--the "negawatt" is truly green!). Do you have any other solutions in mind? I find wind and solar preferable alternatives to fossil fuel use, and nuclear is not economical (by a longshot) at this time. Anxo Aug. 28, 2013 @ 7:48 p.m.
zwills, That's a good question. we want even cleaner green energy. like what? can anybody answer? so again (nobody answered this yet). what my antagonists propose? Just name one alternative, other than candles and go naked, and we can reach a hint of an agreement. Agree with you also in the lights. I live in Morrisville, PA. Every Friday some neighbors have fireworks. This is annoying to me and scare the hell out of my three dogs. Should they be banned to have a useless tradition that just have noise for me? With all due respect, what is really silly is your comparison. Just because the bird is killed in half, this is worse than the million animals killed by cars? And before you answer, check this out. 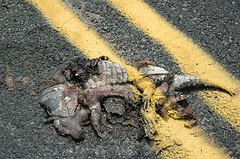 Am I the only one who sees pieces of animals in the road everywhere I go? No more wasting time for me in this thread. I started saying that it was meaningless. And nobody has given me an answer to my question yet, people just get around it. Tighelander Sept. 1, 2013 @ 4:45 a.m.
Is this story a plant by some PR firm to change the public's opinion on clean energy? Years ago I read documents, an agreement between Southwest Strategies and their client SDSU, that SS would hire influential writers, and place those pieces in the paper to change the public's opinion on some proposed landfill in the North County. Is this cover story a similar type of piece? You lose all credibility when you use the Washington Times as a source! The Washington Times is a paper run by GOP/Moonie cult nutjobs. PME Sept. 5, 2013 @ 10:16 p.m. There are many good comments above, especially the comments by Aboggs. It is easy to say the word NIMBY, as long as the turbines are located in someone else's back yard, side yard or front yard. I happen to be forced to live in the middle of Ocotillo Wind. The Ocotillo Plan of Development certainly didn't allow for 438' tall industrial wind turbines. If it had I would not have built a home here. This was also a BLM "Limited Use" designated area. Rules and regulations were changed to allow the Ocotillo Wind Facility. It is now pure hell living with the turbines, not only are they loud at times, the visual pollution is radically wrong and is a constant reminder of government blunders and greed energy policies gone bad. Many people do not believe the wind in Ocotillo is an adequate resource for a viable wind energy project. Check out the Federal Energy Regulatory Commission (FERC) quartely electrical production reports at FERC.com. On a yearly average, less than 20% of this facilities capacity factor will be produced. In fact wind turbines only produce 4% of our nations power. Ocotillo Wind has never supplied the electricity needs for the 125,000 homes that were promised and it never will. Peaker plants are now needed to produce power because wind and solar are unreliable. Wasn't the elimination of fossil fuel plants the reason to persue the so called green energy route in the first place? 12,500 acres of prime desert public land was graded and or disturbed to accomodate this facility and 500 or so acres were permanently destroyed. Industrial wind turbine facilities destroy extremely large parcels of public land. Install solar panels on your existing roof. People and wind turbines don't mix. If any of you, that promote wind turbines, would like to move near the turbines, my home is for sale. Of course it has lost 60% of it's original value. Check out "Save Ocotillo" on Youtube and "Ocotillo Wind Turbine Destruction" on Facebook for the real facts.